Following the demise of the Ottoman Empire in 1925, the country that has emerged on its ashes—the modern Turkey—has chosen the republican form of governance. Mustafa “Ataturk” Kemal ruled with an iron hand for a little over a decade and worked hard to eradicate any form of monarchy in the country’s governance and its religious basis; those who shared Ataturk’s ideals followed suit. According to the author, Fethullah Gulen, an elderly individual shying publicity and based in Philadelphia, is the source of inspiration for a vast network of followers, supporters, friends and sympathizers, which Dr. Hendrick calls the Gulen Movement, who have an enormous impact on the media, publishing and politics in Turkey primarily, and in the world as of late. According to the book, the Gulen Movement is a network of seeming unrelated secondary schools (the so-called Gulen Inspired Schools), mass media outlets of all forms, publishing houses and political lobby groups. However, these institutions squarely dismiss any affiliation with each other. According to Dr. Hendrick, they do so even when links are apparent (page 221). Instead, they continuously insist each institution is independent from each other and any links are coincidental or mere convenience. They do, however, all unanimously agree that Fethullah Gulen has greatly contributed to the promotion of education and dialog of peace throughout the world (page 75). The movement has mastered the business of proving that “there is no organic connection” (page 228) between the overall movement and institutions whose establishment it inspired (mass media outlets, companies, schools, etc.) using media outlets. The author provides lengthy details of one-on-one conversations with editors working on the movement’s image in print, who insistently claim that by covering the achievements of so-and-so business or school, they are only “showing the modern Turkey to the world.” The source of inspiration for the movement, Fethullah Gulen, also dismisses any such links. Therefore, having spent over a year in Turkey researching into the movement, the author poses a vital question: Why then Gulen’s writings are the main topic for meetings (called “conversations”) followers of the movement frequently hold and why are they guiding principles in the followers’ daily lives? Based on his research findings, the author comes to the following conclusion: there is no apparent institutional or legal connection between the various arms of the movement. However, when, say, a Gulen inspired school procures furniture from only a particular producer (page 159), or a particular newspaper intensively covers the achievements of particular businesses either home or abroad an intangible link does surface. This link starts in Fethullah Gulen’s speeches and writings. According to the author’s interlocutors, when Gulen says, for instance, that it would be beneficial to establish schools for studying math and physics, it does not take long before such a school is actually established (page 89). Or, Gulen could rhetorically inquire whether it would be a good idea to establish a bank (page 82) or a mass media outlet. They soon materialize because his followers perceive his “opinion” as his wishes and instructions for action. Thus, there is a unifying ground among societal institutions, which have no apparent commonality either in form or content. That said, such mass media outlets, schools, companies, etc. are established under the unequivocally established goal of business and for-profit, which are again declared to aim at bettering the society’s life. In other words, no religious expansion. But, of course, a furniture factory or shoe-making workshop will only lend money from a bank, whose establishment was once “recommended” by Gulen. The movement’s influence is not limited to education or entrepreneurship. The book’s author suggests that it may seem so that there is no apparent link between the ruling AKP party and the Gulen Movement. Howsoever, the movement does have a significant capacity to shape popular opinion via its media arms, which it uses for the AKP’s benefit. The party does not forget to scratch the party’s back: The movement mostly enjoys the ruling party’s support both at home and abroad. Thus, the “ambiguous politics” exercised by the followers of “market Islam” in Turkey led unprecedented support by the government at home and societies’ (mostly) approval abroad. The movement has established many “Gulen inspired” schools and businesses abroad enjoying the Turkish government’s diplomatic and other kinds of support. Although the book’s author provides an ample amount of direct quotes and personal observational anecdotes, the lack of even one instance of interviewing Gulen himself is a significant loss. 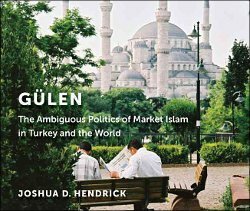 But in that regard, the book is a kind of reflection of the movement: it, too, has “no Gulen” in it.